On Wednesday, April 6, 2016 at 7 p.m, David Genovese, founder of Baywater Properties, will present to the public an overview of the downtown Darien redevelopment project proposed by Baywater Properties and its partner, PG Properties. A full presentation of the project will be given to attendees, with significant time available for questions and comments. The presentation takes place at Darien Library. Contributed — a rendering of what part of the project would look like from across the Post Road. The Baywater venture began work on acquiring the properties from Corbin Drive to the Bank of America Building, including the US Post Office at 30 Corbin Drive and 10 Corbin Drive, in 2005. In July of 2015, Baywater presented the initial concept for its redevelopment proposal to a joint meeting of the Planning and Zoning Commission and the Architectural Review Board. Baywater will soon be filing its next application to the Planning & Zoning Commission, with a goal of attaining all approvals by the end of 2016. To create maximum transparency for the zoning and development process, Baywater created a website, www.yourdowntowndarien.com, on which town residents and interested parties can find significant information about the project as proposed. All presentations made to the Town of Darien and other groups are available for viewing from the site, as are the written presentations, studies, and inspirational materials which have influenced the decision-making of Baywater and its team. A Facebook page, Your Downtown Darien, is also maintained and provides updates on the process and decisions as they are made. Since its launch in August of 2015, over 5,100 people have visited the website. David Genovese explained that when he and his team built 1020 Boston Post Road in 2007 and 2008, they experienced for the first time the intense interest among Darien residents in buildings that are constructed in downtown Darien, how they are designed and to whom they are leased. “We created our website”, Genovese added, “to provide Darien residents with the opportunity to learn about the ways in which we came to our ideas for this project, and to allow them full access to the process as it unfolds without having to go to meetings in Town Hall. “This is a complicated undertaking involving many Darien boards and commissions, and a massive number of interested parties. 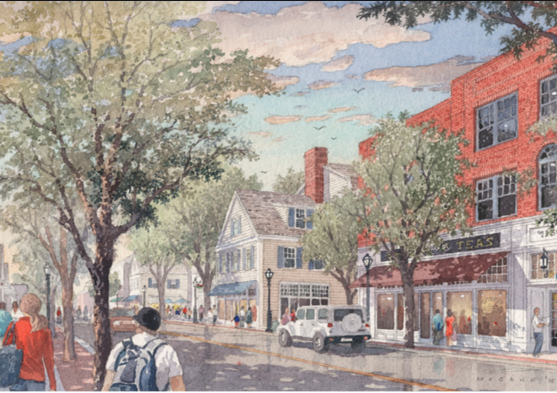 We understand, fundamentally, that our project will have a significant influence on downtown Darien, and we are taking every step possible to ensure that the outcome is enormously positive. Since August of 2015, Genovese has met with over 500 residents to discuss the project, in group presentations as well as in one-on-one conversations. The project, as proposed, will include retail, restaurants, offices and housing. It is anticipated to include up to 30 stores, including an anchor retailer, approximately 66 housing units, and 95,000 square feet of office space. Baywater has also proposed incorporating into the project a “Town Green”, a public space of significant area which could host the Darien Farmer’s Market, concerts, outdoor movies, and potentially an outdoor skating rink in the winter months. This component of the project was inspired by Market Square in Lake Forest, Illinois, a project built in 1916 which is recognized today as one of the best-designed mixed-use projects in the United States. As part of the project, but in a separate location near the Boston Post Road, Baywater has proposed to the Town of Darien the concept of building 12 units of affordable housing, designed to accommodate adults with special needs. For the project, Baywater believes that it has assembled a truly world-class team. The design effort for the project is led by Robert A.M. Stern Architects. Gary Brewer is the partner-in-charge of the effort. Robert A.M. Stern is a practicing architect, teacher, and writer. He is a Fellow of the American Institute of Architects, and received the AIA New York Chapter’s Medal of Honor in 1984 and the Chapter’s President’s Award in 2001. Mr. Stern is the 2011 Driehaus Prize laureate and in 2008 received the tenth Vincent Scully Prize from the National Building Museum. In 2007, he received both the Athena Award from the Congress for the New Urbanism and the Board of Directors’ Honor from the Institute of Classical Architecture and Classical America. As founder and Senior Partner of Robert A.M. Stern Architects, he personally directs the design of each of the firm’s projects. Mr. Stern is the J.M. Hoppin Professor of Architecture and Dean of the Yale School of Architecture. He was previously Professor of Architecture and Director of the Historic Preservation Program at the Graduate School of Architecture, Planning, and Preservation at Columbia University. Mr. Stern served from 1984 to 1988 as the first director of Columbia’s Temple Hoyne Buell Center for the Study of American Architecture. He has lectured extensively in the United States and abroad on both historical and contemporary topics in architecture. He is the author of several books, including New Directions in American Architecture (Braziller, 1969; revised edition, 1977); George Howe: Toward a Modern American Architecture (Yale University Press, 1975);Modern Classicism (London: Thames & Hudson; New York: Rizzoli, 1988); The Philip Johnson Tapes: Interviews by Robert A.M. Stern (Monacelli, 2008); Architecture on the Edge of Postmodernism: Collected Essays 1964–1988 (Yale University Press, 2009); Tradition and Invention in Architecture: Conversations and Essays (Yale University Press, 2011); and Paradise Planned: The Garden Suburb and the Modern City (Monacelli, 2013), coauthored with David Fishman and Jacob Tilove. The retail planning consultant for the project is Gibbs Planning Group of Birmingham, Michigan. Bob Gibbs has been working with David Genovese and the team at Baywater since 2013 on the project. Profiled in The New York Times, The Wall Street Journal, and Urban Land, Gibbs has, writes The Atlantic Monthly, “a commercial sensibility unlike anything possessed by the urban planners who usually design downtown-renewal efforts.” He is also a recognized leader in the New Urbanism, having pioneered the implementation of its environmentally sustainable principles of Traditional Town Planning and Smart Growth. For the past 25 years, Gibbs has been active in developing innovative yet practical methods for applying modern trends in commercial development to more than 400 town centers and historic cities here and abroad. He also planned Michigan’s first ten New Urban communities and Form Based Codes. A speaker at the First Congress of the New Urbanism in 1992 and eight subsequent CNUs, Gibbs lectures frequently throughout the country. He is the author of “Principles of Urban Retail Planning and Development” and the SmartCode “Retail Module,” and has contributed articles to numerous books and publications. For the past 20 years, he has taught “Urban Retail Planning” in the Executive Education Program at the Harvard Graduate School of Design. In 2012, Gibbs was honored by the Clinton Presidential Library for his life’s contributions to urban planning and development and by the City of Auckland, New Zealand for his planning innovations. Civil engineers for the project are Tighe & Bond of Shelton, Connecticut. The legal advisor for the project is Robert Maslan of Maslan & Associates. Tighe & Bond and Maslan have worked with Baywater and PG Properties on most of their projects over the last fifteen years. Baywater Properties is a full-service commercial real estate company serving Fairfield County, Connecticut, and Westchester County, New York. Baywater owns and actively manages a portfolio of commercial real estate assets totaling approximately 700,000 square feet. Information about Baywater Properties can be found on its website, www.baywater.net.